The 24th edition of the Seattle International Film Festival turned out to be one of its best. 16 world premieres including the Quinn brothers' new film, "This is My Father," and 22 U.S. premieres, including Valery Todorovsky's Russian crime drama, "Land of the Deaf," which won the New Directors' Showcase prize; Carine Adler's tale of an inconsolable teenager, "Under the Skin," and Niklas Roy's German short movie, "Trigon." Julia Sweeny's outstanding film of her one-woman stage show, "God Said Ha!," took top honors at the Festival's closing ceremonies. Frank Todaro's sweet sleeper, "Above Freezing," was the runner-up for best picture, followed by the Iranian film, "Children of Heaven," Chris Eyre and Sherman Alexie's locally produced "Smoke Signals" and Ernest Dickerson's powerful made-for-TV drama about racism and homophobia, "Blind Faith." One of the Festival's unheralded surprises was the world premiere of Ulli Lommel's "I Want To Be a Vampire," a very unusual, campy, and metaphorical horror movie that played at midnight. It was not offered in competition, but may contain enough appeal and controversy to do what most of the Festival's critical successes will not: Play in theaters. 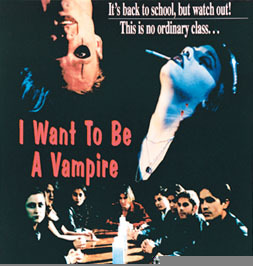 The story is about a young girl's obsession with becoming a bloodsucking vampire, and her vampire "mentor" who tests her resolve to follow through with her wish. It is also a parable about what happens to teenagers who come to Hollywood to become celebrities. With a modest budget, this teen thriller could turn out to be profitable during its Halloween launch in theaters, nationwide. Although it probably won't give "Scream" or "Scream 2" a run for their money, "I Want To Be a Vampire" could end up doing nicely, especially in the ancillary markets. Small wonder all the Hollywood studios are rushing out to make movies that appeal to teens. If enough avant garde and independent filmmakers get the urge to break into the realm of profitability, we may see more teen angst on-screen at next year's Festival.